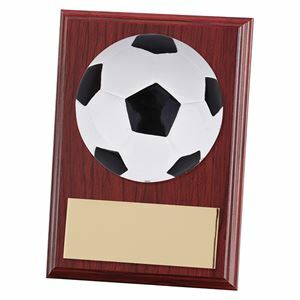 At Impact Trophies & Medals, we offer a huge range of football shields and plaques suited to any club or league event or competition. 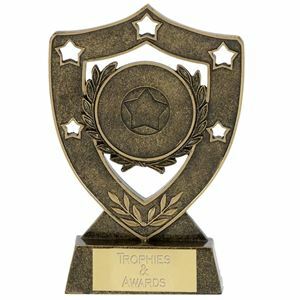 Our extensive range includes budget plastic plaques, premium crystal plaques and wooden shields for individual and annual awards. Impact Trophies & Medals are a leading retailer of football shields & plaques. Great for personalisation, many of our plastic & crystal plaques and wooden football shields can be personalised with high quality text plate or surface text and logo engraving or printed logo inserts, to perfectly meet all your football club or team presentation needs. Competitively priced, this neat wooden Horizon Football Plaque, would make a good prize option for large scale events or those on a small budget. Finished with a cherry wood effect veneer, the plaque comes with a self adhesive printed football image to be applied to the front. 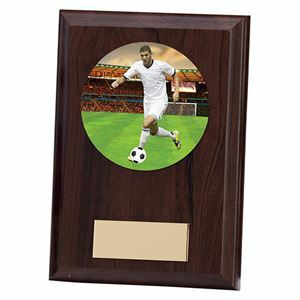 Offering exceptional value for money, the Phantom Football Plaque is a wooden award featuring a self adhesive printed football image. Printed in colour, the image depicts a male footballer in a stadium wearing white kit, running with a football. The polished plaque is finished in a mahogany effect and would make an ideal team award. The self standing Mahogany Football Plaque is an excellent option for rewarding footballing talent. The rectangular veneered wood plaque is finished in a burnished mahogany veneer with smooth bevelled edges. A gold circular plaque is mounted on the front, embossed with a laurel wreath and football. A round framed recess is also featured which can display a printed logo insert. The plaque can be further personalised with a plate which can be engraved with a bespoke inscription.